The world is getting smaller and increasingly interdependent every day. As a result, national and regional developments are, as a matter of necessity, seen in a global framework. States want to preserve their independence but they are confronted with a growing list of problems, which they can only solve in co-operation with others. The sheer scale of the issues at stake calls for an institutional framework to give that co-operation a more permanent structure. Hence, decisions taken at the national level and results of intergovernmental co-operation have become closely intertwined. 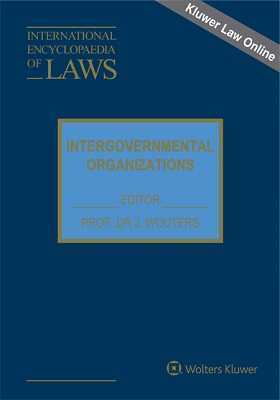 It is therefore appropriate in the framework of the International Encyclopaedia of Laws to make accessible comprehensive, substantial and readily available information on the most important Intergovernmental Organizations (IGOs), given their importance for the development of international law and intergovernmental co-operation in general. The fundamental changes taking place nowadays at an incredible pace within IGOs render it all the more necessary to put this information within easy reach. Some 55 leading organizations will be described in separate monographs of approximately 150 pages each. For more information and an up-to-date list of the jurisdictions for this looseleaf, go to KluwerLawOnline. 2. Constitutional Treat(y/ies) / Document(s) (incl. interpretation interpretation & amendment). 5. External relations (incl. treaty-making powers and relations with other organizations). GENERAL SECTION: List of Contributors; Introducing the International Encyclopaedia of Intergovernmental Organizations; Curriculum Vitae of the Editors.